I really struggle when it comes to wearing natural, organic skincare products. As much as I would absolutely love to, I have a lot of skin sensitivities and allergies that prevent me from doing so. But that doesn't mean I'm stopping the search. While the allergist I saw was less than helpful (apparently one of the things I'm allergic to is "unique trees", because that really narrows things down), I am starting to narrow down what I can and cannot wear. Aloe, for example, is a big no-go, as is anything within the geranium family. 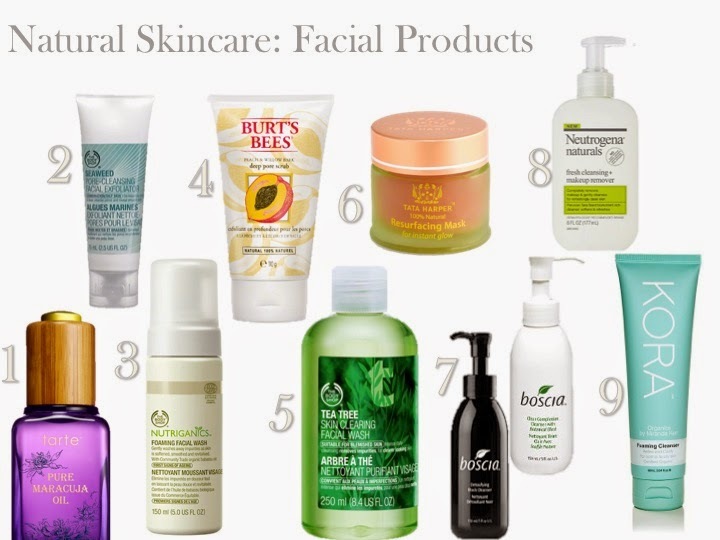 Below are a list of facial products that I either want to try, or have tried and believe will work for others. 1. The Tarte Maracuja Oil claims to leave your skin brighter, firmer, and healthier. It is derived from an Amazonian Fruit, and is hand pressed to preserve nutrients. If you want to try it first (since it is quite expensive), you can go into Sephora and ask for a small take-home sample, or purchase the rollerball version for $20 CND. It smells great and feels amazing. The best thing? All Tarte products are Vegan friendly. 2. The Body Shop Seaweed Pore Cleansing Facial Exfoliator uses seaweed from Ireland (huh, who knew? ), and is rich in minerals, which leaves your skin looking matte. 3. The Body Shop Nutriganics Foaming Facial Wash uses "community trade organic babassu oil from Brazil", "organic mallow flower from Switzerland and Community trade organic sugar from Paraguay" to soften and clean skin. A great thing with the Body Shop is they have a ton of samples available. All you have to do is ask! 4. Burt's Bees Peach and Willowbark Deep Pore Scrub is an all natural and sulfate free cleanser, that uses finely-gound peach stone, and willowbark extracts, to maintain skins natural moisture while providing a deep cleans. I really want to try this product, partly because it's 98.45% natural, and partly because I absolutely love peaches (I could live off of peaches and nectarines in the summer). 5. The Body Shop Tea Tree Skin Clearing Facial Wash helps control blemishes, with a formula gentle enough for daily use. The Tea Tree is derived in association with "The Kenya Organic Oil Farmers' Association". It is a fair trade organization, and works with approximately 550 local organic farmers to sustain the local economy. It also provides workers with good working conditions and fair wages. 6. This is a natural and non-toxic facial mask, and claims to use 100% natural, and 81% organic products. It is a high-preformance anti-aging treatment, and leaves skin looking younger and fresher by using promogranate enzymes and pink-clay. It can be found on the J.Crew website, or on the Tata Harper website. This product is also an Elle Magazine award winning product! 7. The Boscia Detoxifying Black Cleanser, and Clear Complexion Cleanser both unclog pores to provide an overall smother appearance. They contain ingredients like artichoke leaf extract, vitamin C, and willow bark. They are available through the Bosica website (linked above), or on Sephora.com. All Boscia products are botanically derived and preservative free. 8. The Neutrogena cleansers do not contain any harsh chemicals, sulfates, parabens, petrolatum, dyes, or phthalates. While I had an unpleasant reaction to this product, I've known others who can use it, and enjoy it (plus, it smells amazing). 9. Kora Organics is the Miranda Kerr line. While I'm not into buying something because it's associated with a certain celebrity, I think that using your influence to promote a healthier way of life is a great thing to do. The Kora products contain aloe vera, green tea, and sandalwood extracts, and are safe to use morning and night. What's your favourite skincare product? Do you opt for organic items, or is it not worth the price or hassle?